So many have told us they would spend more time volunteering, but they have to earn a living. Problem solved! See those people out there on the highway? 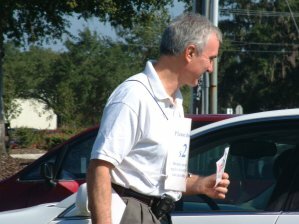 They will pay you to hand them bumper stickers -- not all, but quite a few of them -- enough to support your efforts handsomely. And every time a bumper sticker gets on a car, you will have told a lot of people that they can cure things. Your objective is to avoid the person who doesn't want it. Get on to the person who already wants to help. This is identification of people who already see and want it. You then serve them. Your objective is to identify, and get to, and interact with the people who want it as quickly, and briefly as possible, so you can identify and get to the next people who want it. 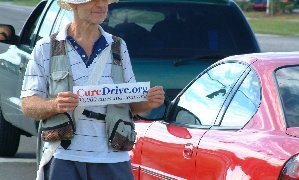 Do you get what CureDrive is? What is it? Good. You're looking for people in the left turn lane like you -- they get it. 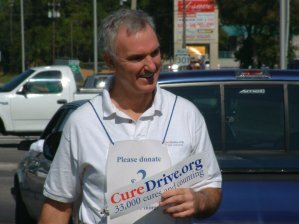 Find the people who will support the Cure Drive. 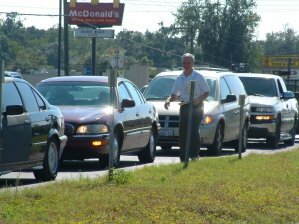 They are interspersed, peppered, through the line of cars stopped at the intersection in the left turn lane. There is an occasional light with none, but usually there are two or three, and sometimes a lot more. If you can do this for even 30 minutes, a day or two a week, on your lunch hour or right after work, you will make a difference. You are completely independent. We have no requirement for how many days per week you engage in this. People who wish to do it one day a week are fine with us. Your days are completely flexible. This can be done any day, any time(s) between 10 AM and 5 PM. Earnings are by donation, which you keep. 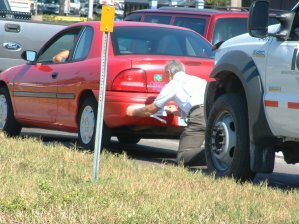 You should expect to receive $30-$70 per hour once you fully develop your contact procedures and skills, and depending on your city and choice of intersection. People who go out during all available active hours in a given month should expect to distribute 1500-3000 stickers. Good contact with and enjoyment of people is a must. You are legal in all countries where there is a church/state separation, and you don't need any permit, but it's a good idea to carry documentation, just in case. Some people ask for the sticker without donating, or just say they can't donate, in which case I always give them the sticker anyway. And some people offer up less than two dollars, or some change. And some people give more -- a bunch of dollars, or five dollar bill, or $10 bill. Everybody's different, but the thing they have in common is they want to help. Which would indicate that lots of people in the ordinary everyday environment instantly relate to the idea that people cure things. 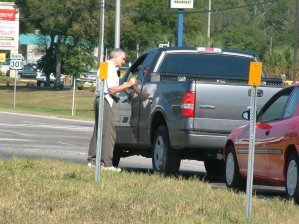 Popular support for the CureDrive is in the left turn lane at an intersection near you. Many people will offer you small amounts of change. You'll probably gratefully accept these, since they will be above your cost, and sometimes, when they're below your cost, you'll still feel thankful, and want to give the person the sticker. 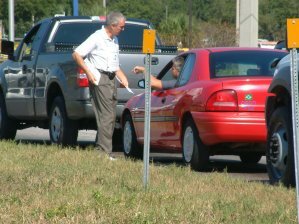 A lot of significant communications are transferred within the few seconds that you have with people there on the median. 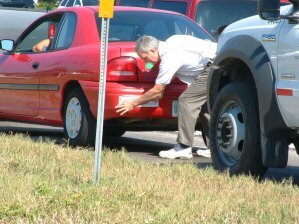 For example, one person immediately told Greg that he would certainly put a sticker on his car, because his wife had just died of cancer. You don't have to give anybody a sticker without a donation. I give things away, or accept whatever I'm offered, because it makes me feel good to do it that way. You earn your money at something like this because you like freedom. You like doing it when you want, where you want. You like starting when you want, and stopping when you want. You like creating your own structure. You like not being answerable to anyone. "Make the number go up; put this on your car, or just donate something." because you can help your neighbors cure the flu. When people see a bumper sticker once, it has very little effect on them. Twice, and they take notice. Three times, they get curious. Four times, they know it's real. Five times, they start asking about its relevance to them. If we can tell enough people, especially media people, that they can cure things enough times and quickly enough, we may be able to prevent the killer flu pandemic that's predicted. Meaning, we want you to earn as much as possible. We need people who earn enough money to live well. Living well is very important when you're volunteering. After you finish for the day you want to go to a nice Japanese restaurant with the other volunteers and order a sumptuous meal of squiggly little slithery things, and beer to wash them down with. We're happy for you to keep the donations to fund your efforts; you are a valid charity and ministry when you do this job. We hereby give you our blessings, and we'll give you whatever empowerment we can. Many people hand you a donation, and say "keep the sticker." They just don't want it wasted, and they know they won't put it on their car. Our job, yours, and mine is to be grateful to everyone for whatever help they give, and thank them for it. Complete expressing your gratitude before you move on. Lend stickers to your friends, and take your friends out with you for their first time. Maybe the second and third time, too. Pool your resources. Pool your perceptions. Find somebody who needs the money. You'll be helping them with their life, as well as helping the world. Or make a new friend and get them into it. There are plenty of people working at Arby's and Wal-Mart who should be doing this instead. They'd probably earn more. ; they'd do more for the world; and, consequently, they'd feel better about themselves. The essence of our project is to create high visibility of cure in your world. You can do that, no matter who you are, or what your personal situation is. You are now fresh out of excuses about how you have no one to tell -- there are plenty in the left turn lane at an intersection near you. 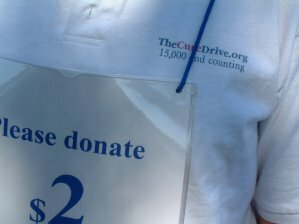 It helps to wear a shirt, or some other upper body garment that says CureDrive -- it makes you official! Here is a breakdown of the donations we need, in advance, for various quantities of bumper stickers..